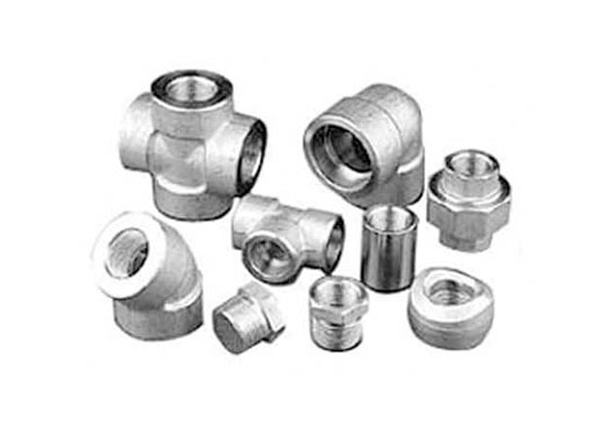 Rexton Steel & Alloys Monel K500 Threaded Forged Fittings, ASTM B564 Monel K500 Threaded Elbow, K500 Monel Threaded Bushing, Monel K500 Threaded Union, Monel K500 Threaded Tee, K500 Monel Lateral Tee, K500 Alloy Threaded Cap Manufacturer and Suppliers In Mumbai, India. offers a wide range of Monel Alloy K500 Forged Threaded fittings, where our expert professionals make use of excellent quality material in the production process. Typical applications for our Monel K500 Forged Threaded Elbow (UNS N05500) are pump shafts and impellers; doctor blades and scrapers; oil – well drill collars and instruments; electronic components; springs; and valve trim. These Monel K500 Forged Threaded Tee is a nickel – copper alloy, precipitation hardenable through additions of aluminum and titanium. Our Monel K500 Forged Threaded Cross has approximately three times the yield strength and double the tensile strength when compared with Monel 400 Forged Threaded Cross Fittings. These Monel K500 Forged Threaded Cap also has excellent corrosion resistance together with increased strength and hardness of that of Alloy 400. Meanwhile, our Monel K500 Forged Threaded Fittings are also being offered in different sizes and shapes to our customers. These Monel K500 Forged Threaded Coupling can be readily joined and fabricated, which further has excellent mechanical properties at subzero temperatures. By proper control of the amount of hot or cold work and by the selection of appropriate thermal treatments, finished fabrications in our Monel K500 Forged Threaded Union can be produced to a rather wide range of mechanical properties. These Monel K500 Forged Threaded Bushing is used in the section of Alkylation units in direct contact with concentrated hydrofluoric acid.